Pippoglyph Playing Cards mark a return to the print medium for Ben Crenshaw showcasing his dynamic graphic designs in a format that may seem entirely new to those familiar only with his jewelry. 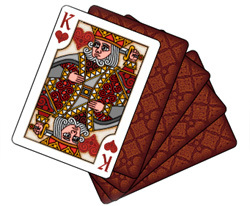 Their stylish sophistication is sure to appeal to serious card players and collectors alike. Copyright © cribbageboard.com. All rights reserved.